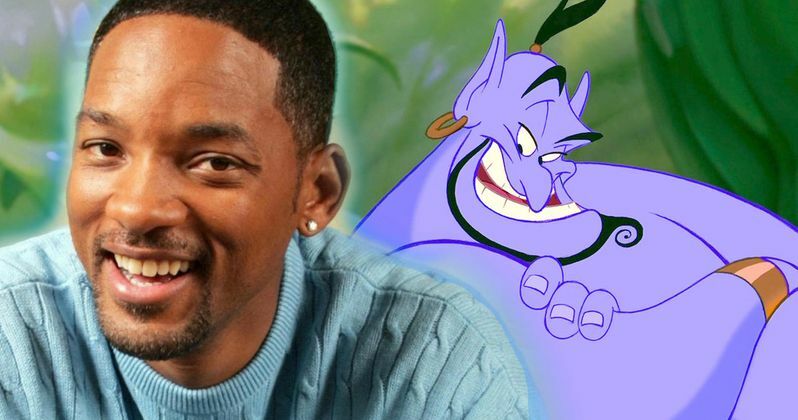 Could the former Fresh Prince of Bel-Air be the man tasked with taking on the role of the Genie in the upcoming live-action remake of Aladdin? Looks like it. Disney seems bound and determined to lock down Will Smith for a role in one of their live-action remakes, since they were also recently trying to sign him up for Tim Burton's Dumbo. The latest news states that the actor is being courted to play the role of the Genie, originally made famous by Robin Williams, in the Aladdin remake. The news comes courtesy of Deadline, who are reporting that Will Smith is in talks with Disney right now for the role of the Genie in director Guy Ritchie's version of Aladdin. The movie is gearing up to shoot later this year in the U.K. and, according to this report, the shoot will be six months long, which is something Will Smith will have to consider before signing on the dotted line. For Disney's end of it, they have to consider shelling out big bucks, because Will Smith doesn't come cheap. But his star power has risen once again with the help of movies like Suicide Squad, so he could be a valuable asset to the live-action Aladdin movie. Will Smith is quite the beloved actor, but even when taking that into account, it is going to be incredibly difficult for people to accept anyone other than the late Robin Williams as the Genie. The legendary comedian provided the voice for the character in the 1992 animated classic and it is easily one of his most iconic roles. Apart from that, Robin Williams was truly one-of-a-kind and was one of the most distinctive actors out there. That said, it is seemingly the best possible choice for Disney to not try and get someone to do their best approximation of that performance. Rather, get someone else with a lot of charisma and distinctiveness in their own right to try and make it their own thing. Will Smith certainly has the charisma and he most definitely has some serious acting chops as well, both in more serious roles and in big blockbuster movies. Plus, since this is going to be a musical, it helps that he has a background in music as well, aside from his accomplished career as an actor. Despite the difficulty of having to live up to the legacy left behind by Robin Williams, Disney has every reason to believe a live-action remake of Aladdin will work. They have had a ton of success with similar remakes in recent years, with Beauty and the Beast recently crossing the $1 billion mark at the global box office and The Jungle Book coming just shy of that milestone last year. Other movies like Cinderella and Alice in Wonderland have also proved to be very profitable for the studio. That being the case, Aladdin is just one of many similar remakes the studio is currently working on, with The Lion King, The Little Mermaid, Mulan and more all in various stages of development. The studio is currently in the process of casting for the lead roles of Aladdin and Jasmine and, thanks to a recent casting call, it has been made clear that the studio has no interest in "whitewashing" those roles for this movie. The script for this new take on Aladdin is being written by John August, with Dan Lin set to produce. A release date for the live-action Aladdin has not yet been set, but with the movie expected to wrap production early next year, it is possible Disney could be looking to release it in either late 2018 or perhaps in early 2019.